Before :- M.B. Shah and D.M. Dharmadhikari, JJ. For the Petitioners :- Ujwal Kumar Jha, Aslam Ahmed, Ranjan Kumar Jha, Nakul Dewan Advocates. For the Respondent :- S.K. Dholakia, Sr. Advocate and Ms. Hemantika Wahi, Advocate. A. Criminal Procedure Code, Sections 451 and 457 - Case property stolen or lost - Magistrate may order payment of value of property to claimant. 1977(4) SCC 358 relied on. (3) if the property is subject to speedy and natural decay, to dispose of the same. 1. Valuable property such gold, silver should not be kept in Police Custody for years till trial is over - Magistrate should pass appropriate orders as contemplated under Section 451 Cr.P.C. at the earliest. (c) after taking proper security. 3. If property is not handed over on sapurdari, then such articles be kept in bank lockers. 4. Vehicles should not kept at police stations for long - These should be given in sapurdari by taking adequate security - Vehicle should auctioned if there is no claimant. 5. For articles such as seized liquor also, prompt action should be taken in disposing it of after preparing necessary panchnama. 6. For the Narcotic drugs also, for its identification, procedure under Section 451 Cr.P.C. should be followed of recording evidence and disposal. Smt. Basavva Kom Dyamangouda Patil v. State of Mysore, 1977(4) SCC 358. M.B. Shah, J. 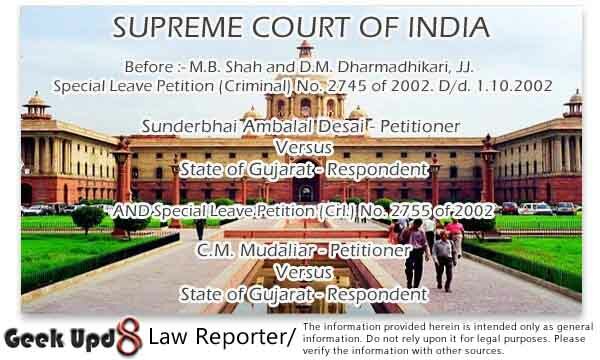 - In these two petitions filed by the police inspectors serving the Gujarat State, it has been contended that prosecuting agency has no right to ask for remand of petitioners (accused) for the purpose of collecting evidence and the application moved for remand of the petitioners (accused) was unjustified because anticipatory bail was granted to them. 2. It is the prosecution version, as per the FIR lodged on 7.2.2002 by the Assistant Commissioner of Police 'D' Division, Surat that petitioners and other police personnel are involved in offences punishable under Sections 429, 420, 465, 468, 477-A and 114 IPC. It is alleged that when they were working at various polices stations, they have committed offences during the period from 20.2.1992 to 23.11.2001 by replacement of mudammal articles including golden ornaments by other spurious articles, misappropriation of the amount which was kept at the police station, unauthorised auction of the property which was seized and kept in the police custody pending trial and tempering with the records of police station. The High Court by its judgment and order dated 20.6.2002 rejected the application against the order passed by the trial Court granting of the petitioner. Hence, these special leave petitions. 3. At the time of the hearing of these matters, learned counsel for the parties submitted that various articles are kept at the police station for a long period not adhering to the procedure prescribed under Cr.P.C., which creates difficulties for keeping them in safe custody. Finally, the sufferers are - either the State exchequer or the citizens whose articles are kept in such custody. It is submitted that speedier procedure is required to be evolved either by the Court or under the rules for disposal of muddamal articles which are kept at various police stations as most of the police stations are flooded with seized articles. It is, therefore, submitted that directions be given so that burden of the Courts as well as at the police station can, to some extent, be reduced and that there may not be any scope for misappropriation or of replacement of valuable articles by spurious articles. "451. Order for custody and disposal of property pending trial in certain cases. - When any property is produced before any Criminal Court during any inquiry or trial, the Court may make such order as it thinks fit for the proper custody of such property pending the conclusion of the inquiry or trial, and, if the property is subject to speedy and natural decay, or if it is otherwise expedient so to do, the Court may, after recording such evidence as it thinks necessary, order it to be sold or otherwise disposed of. 457. Procedure by police upon seizure of property. - (1) Whenever the seizure of property by any police officer is reported to a Magistrate under the provisions of this Code, and such property is not produced before a Criminal Court during an inquiry or trial, the Magistrate may make such order as he thinks fit respecting the disposal of such property or the delivery of such property to the person entitled to the possession thereof, or if such person cannot be ascertained, respecting the custody and production of such property. (2) If the person so entitled is known, the Magistrate may order the property to be delivered to him on such conditions (if any) as the Magistrate thinks fit and if such person is unknown, the Magistrate may detain the articles of which such property consists, and requiring any person who may have a claim thereto, to appear before him and establish his claim within six months from the date of such proclamation." 6. It is submitted that despite wide powers, proper orders are not passed by the Courts. It is also pointed out that in the State of Gujarat there is Gujarat Police Manual for disposal and custody of such articles. As per the Manual also, various circulars are issued for maintenance of proper registers for keeping the muddamal articles in safe custody. 4. This jurisdiction of the Court to record evidence should be exercised promptly so that there may not be further chance of tampering with the articles. "4. The object and scheme of the various provisions of the Code appear to be that where the property which has been the subject-matter of an offence is seized by the police, it ought not to be retained in the custody of the Court or of the police for any time longer than what is absolutely necessary. As the seizure of the property by the police amounts to a clear entrustment of the property to a Government servant, the idea is that the property should be restored to the original owner after the necessity to retain it ceases. It is manifest that there may be two stages when the property may be returned to the owner. In the first place it may be returned during any inquiry or trial. This may particularly be necessary where the property concerned is subject to speedy or natural decay. There may be other compelling reasons also which may justify the disposal of the property to the owner or otherwise in the interest of justice. The High Court and the Sessions Judge proceeded on the footing that one of the essential requirements of the Code is that the articles concerned must be produced before the Court or should be in its custody. The object of the Code seems to be that any property which is in the control of the Court either directly or indirectly should be disposed of by the Court and a just and proper order should be passed by the Court regarding its disposal. In a criminal case, the police always acts under the direct control of the Court and has to take orders from it at every stage of an inquiry or trial. In this broad sense, therefore, the Court exercises an overall control on the actions of the police officers in every case where it has taken cognizance." 9. The Court further observed that where the property is stolen, lost or destroyed and there is no prima facie defence made out that the State or its officers had taken due care and caution to protect the property, the Magistrate may, in an appropriate case, where the ends of justice so require, order payment of the value of the property. 10. To avoid such a situation, in our view, powers under Section 451 Cr.P.C. should be exercised promptly and at the earliest. 11. With regard to valuable articles, such as, golden or silver ornaments or articles studded with precious stones, it is submitted that it is of no use to keep such articles in police custody for years till the trial is over. In our view, this submission requires to be accepted. In such cases, Magistrate should pass appropriate orders as contemplated under Section 451 Cr.P.C. at the earliest. (3) after taking proper security. 13. For this purpose, the Court may follow the procedure of recording such evidence, as it thinks necessary, as provided under Section 451 Cr.P.C. The bond and security should be taken so as to prevent the evidence being lost, altered or destroyed. The Court should be see that photographs of such articles are attested or countersigned by the complainant, accused as well as by the person to whom the custody is handed over. Still, however, it would be the function of the Court under Section 451 Cr.P.C. to impose any other appropriate condition. 14. In case, where such articles are not handed over either to the complainant or to person from whom such articles are seized or to its claimant, then the Court may direct that such articles be kept in bank lockers. Similarly, if articles are required to kept in police custody, it would be open to the SHO after preparing proper panchnama to keep such articles is bank locker. In any case, such articles should be produced before the Magistrate within a week of their seizure. If required, the Court may direct that such articles be handed over back to the Investigating Officer for further investigation and identification. However, in no set of circumstances, the Investigating Officer should keep such articles in custody for a longer period for the purpose of investigation and identification. For currency notes, similar procedure can be followed. 15. Learned senior counsel Mr. Dholakia, appearing for the State of Gujarat further submitted that at present in the police station premises, number of vehicles are kept unattended and vehicles become junk day by day. It is his contention that appropriate directions should be given to the Magistrates who are dealing with such questions to hand over such vehicles to its owner or to the person from whom the said vehicles are seized by taking appropriate bond and the guarantee for the return of the said vehicles if required by the Court at any point of time. 16. However, the learned counsel appearing for the petitioners submitted that this question of handing over vehicles to the person from whom it is seized or to its true owner is always a matter of litigation and a lot of arguments are advanced by the concerned persons. 17. In our view, whatever be the situation, it is of no use to keep such seized vehicles at the police stations for a long period. It is for the Magistrate to pass appropriate orders immediately by taking appropriate bond and guarantee as well as security for return of the said vehicles, if required at any point of time. This can be done pending hearing of applications for return of such vehicles. 18. In case where the vehicle is not claimed by the accused, owner, or the insurance company or by third person, then such vehicle may be ordered to be auctioned by the Court. If the said vehicle is insured with the insurance company then insurance company be informed by the Court to take possession of the vehicle which is not claimed by the owner or a third person. If Insurance company fails to take possession the vehicles may be sold as per the direction of the Court. The Court would pass such order within a period of six months from the date of production of the said vehicle before the Court. In any case, before handing over possession of such vehicles, appropriate photographs of the said vehicle should be taken and detailed panchnama should be prepared. 19. For articles such as seized liquor also, prompt action should be taken in disposing it of after preparing necessary panchnama. If sample is required to be taken, sample may kept properly after sending it to the chemical analyser, if required. But in no case, large quantity of liquor should be stored at the police station. No purpose is served by such storing. 20. Similarly for the Narcotic drugs also, for its identification, procedure under Section 451 Cr.P.C. should be followed of recording evidence and disposal. Its identity could be on the basis of evidence recorded by the Magistrate. Samples also should be sent immediately to the Chemical Analyser so that subsequently, a contention may not be raised that the article which was seized was not the same. 21. However these powers are to be exercised by the concerned Magistrate. We hope and trust that the concerned Magistrate would take immediate action for seeing that powers under Section 451 Cr.P.C. are properly and promptly exercised and articles are not kept for a long time at the police station, in any case, for not more than fifteen days to one month. This object can also be achieved if there is proper supervision by the Registry of the concerned High Court in seeing that the rules framed by the High Court regard to such articles are implemented properly. Adjourned for three weeks.